Domino’s pizza creates an outward (and contagious) ripple of joy, delight, and cheerfulness. Indeed, it is enough to make you momentarily forget about the weariness and challenges of the day, and instead focus on “love at first bite” – that’s the #DominosEffect ! When a company shows that it understands and empathizes with the grief associated with Metro Manila traffic, and does an amazing gesture in order to put smiles on people’s faces, then it is no wonder that the #DominosEffect video has taken the Internet by storm. 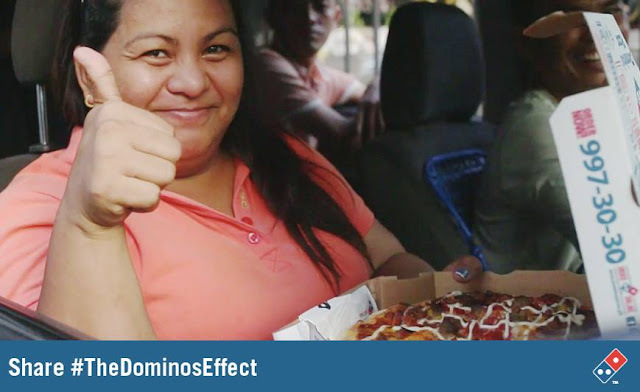 According to the company, they are “delivering delight, one pizza at a time.” While there’s no doubt that Domino’s Pizza will surely translate into delight, it is the message to share and spread this #DominosEffect that really resonates and deserves to be passed on. The world can certainly use more smiles, joy, and laughter nowadays.